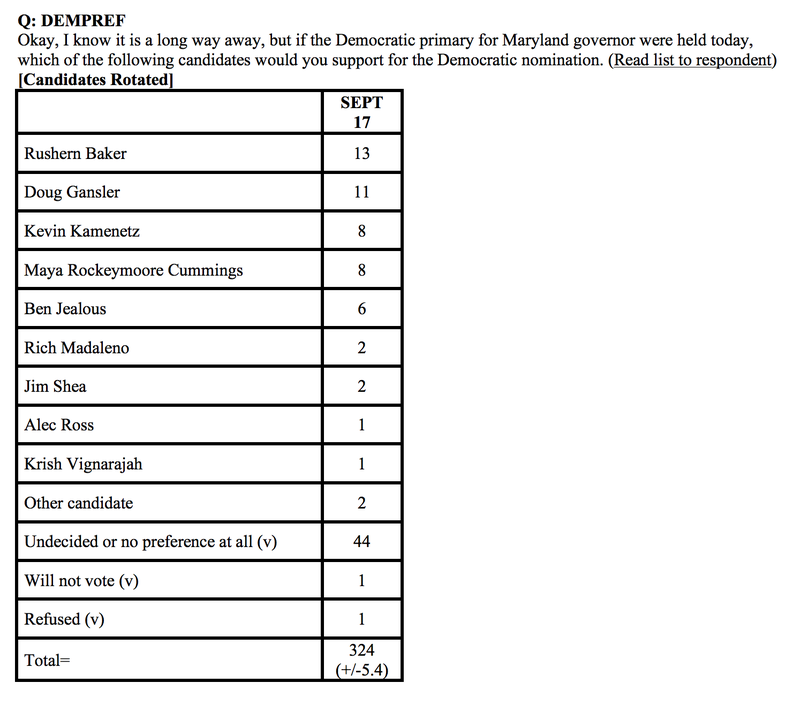 Baltimore— The Goucher Poll asked likely Maryland Democratic voters about next year’s gubernatorial primary. The Goucher Poll surveyed 324 Maryland Democratic primary voters from September 14-18 and has a margin of error of +/-5.4 percent. 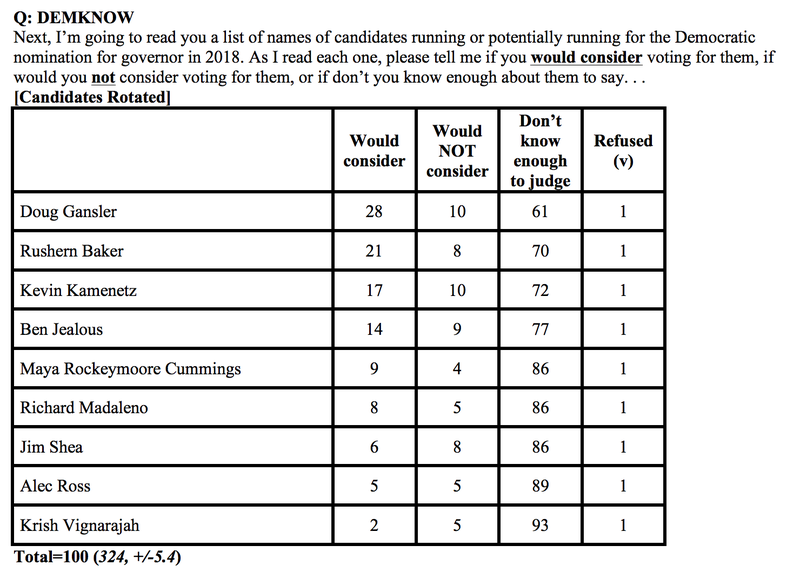 Large majorities of Democratic likely voters indicate they don’t know enough about the current field of potential and declared Democratic gubernatorial candidates to decide whether they would or would not consider voting for each one. Doug Gansler, the former Maryland Attorney General and candidate for the Democratic nomination for governor in 2014, has the highest name recognition in the Democratic field. Twenty-eight percent of likely Democratic voters say they would consider voting for Gansler. On September 18—after the Goucher Poll completed interviews—Mr. Gansler announced his decision not to run for governor. Twenty-one and 17 percent of the Democratic primary voters say they would consider voting for Prince George’s County Executive Rushern Baker and Baltimore County Executive Kevin Kamenetz, respectively. Fourteen percent of likely Maryland Democratic voters say they would consider voting for Ben Jealous, the former president of the NAACP. When asked which candidate they would support if the Democratic primary election were held today, 44 percent say they don’t know, 13 percent say they would support Rushern Baker, and 11 percent say they would support Doug Gansler. Education (26 percent), economy/jobs (21 percent), racial/social justice (16 percent), and healthcare (15 percent) were identified as the most important issues in determining a vote for governor among Democratic likely voters. Democratic voters are divided in their ideological preference of the eventual Democratic nominee. Thirty- four percent prefer a nominee who is “more moderate,” while 55 percent hope that a candidate who is “more progressive” is nominated. Eight percent say they want a “more conservative” Democratic nominee. Mileah Kromer, the director of the Sarah T. Hughes Field Politics Center, will be available for comment. She can be reached directly at mileah.kromer@goucher.edu. Complete results, including methodology and question design, can be downloaded here. With Gansler stating that he is not running in 2018, it appears as Baker, Kamenetz and Jealous have the name recognition advantage. Vignarajah appears to have the biggest hill to climb to introduce herself to potential voters. With 44% of people answering “undecided” in the poll, this race is very much wide open. I was a little surprised that Cummings had 8% for this question..will this be enough to convince her to jump into the race in 2018? The numbers for Madeleno, Shea, Ross and Vignarajah are really low and they all have a lot of work to do in the near future. It is a long campaign season (June 26, 2018 is the Primary)…do you have a favorite candidate at this point? You can view all of the candidates websites and social media channels on the Technology Outreach Scorecard.